Some time in the summer of 1973, or possibly 1974, I was surprised to be awoken from my slumbers late one night by my mother, who, in a surprising and highly unprecedented gesture, invited my little brother and me to get up and watch a TV programme of which I’d never heard, called M*A*S*H. I loved it, and watched it whenever it was shown after that. 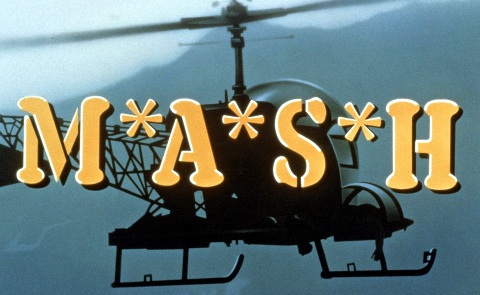 Some twelve years later, after the series had finally come to an end, the BBC started a long run of M*A*S*H repeats from the very first episode. I recorded as many of them as I could, onto VHS tapes. Eventually I had a large collection of VHS recordings of M*A*S*H. I kept them for many years; until the series was released on DVD in fact, two or three years ago. But I never watched them. Somehow, even after I had every single episode on DVD, the mood to watch one of them just never took me. It vaguely bothered me for years that I could never get round to watching this programme I loved so much as a young person. And it irritated me especially that for about 20 years a large stash of video recordings had taken up space in my various homes, never to be watched. Well, in February this year, I finally mustered the resolve to watch them. I decided that I would watch every single episode, in sequential order, in 2008. I started my M*A*S*H marathon at the end of February with the pilot episode, originally broadcast in 1972, with the intention of sitting down some time on or before December 31st to watch the final episode, Goodbye, Farewell and Amen, first shown in 1983. In fact, my journey came to an end tonight. I have watched every one of the two-hundred and fifty-one episodes of M*A*S*H in the last eighty-two days; an average of three per day. There hasn’t been a single day in that time when I haven’t seen at least one episode. On most days I have watched two or three, and on some days I have watched four or five. I have watched M*A*S*H on the train to and from work on my Nokia handheld, I have watched M*A*S*H on my computer at work at lunchtime, I have watched M*A*S*H on the TV in my bedroom and in my living room. The Korean War lasted eleven years for TV viewers in the 1970s and early 1980s. It lasted three years in reality, but for me it lasted twelve intense weeks. I honestly had tears in my eyes when the joyous news came tonight that the war was at an end. Incidentally I discovered a few days after starting my epic journey through M*A*S*H that I had commenced it twenty-five years to the day after the series came to an end. Goodbye, Farewell and Amen was broadcast originally on February 28th 1983, to a record US television audience.